As of 11 am, the center of Hurricane Florence is located approximately 885 miles southeast of Emerald Isle. The Category 4 storm currently has maximum winds of 130 mph, and is moving west-northwest at 16 mph. Florence is expected to strengthen, and winds are expected to reach 150 mph on Wednesday. Hurricane Florence is a potentially life-threatening storm, and Emerald Isle is likely to receive significant impacts - in terms of wind, storm surge, and rainfall. 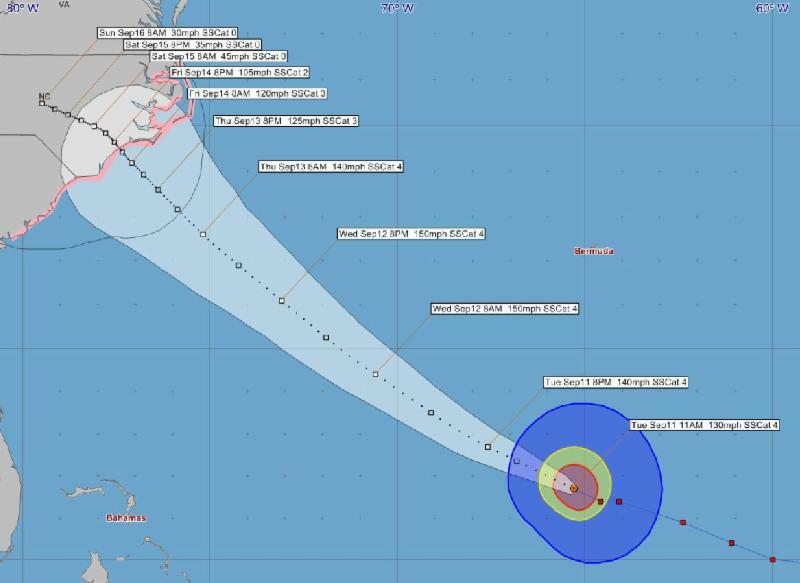 Florence is currently projected to make landfall on Topsail Island early Friday afternoon as a very dangerous storm. Under the current forecast track, tropical storm force winds are expected to begin in Emerald Isle sometime on Thursday morning, and the storm is expected to actively impact Emerald Isle on Thursday, Friday, and Saturday. Aside from the near-certainty that it will make landfall somewhere on the North Carolina coast, the exact track of Florence is still highly uncertain. The current forecast track projects landfall at Topsail Island, which is among the worst possible scenarios for Emerald Isle as it puts us in the most dangerous, northeast quadrant. The exact track of Florence will most likely be slightly adjusted several times over the next 60 - 72 hours, and the exact track will determine where and when the most significant impacts occur along the North Carolina coast. If Hurricane Florence follows the current forecast track and intensity, the impacts are projected to be worse than anything Emerald Isle has experienced in at least the last 20 years, if not longer. The Town urges all of our residents, property owners, and visitors to take Florence extremely seriously and plan accordingly. Additional updates will be provided often via the Town's digital platforms listed below. Please stay informed! Emerald Isle is under a MANDATORY EVACUATION ORDER, and everyone should be making plans to leave Emerald Isle now. All residents, property owners, and visitors are advised to evacuate Emerald Isle no later than 8 pm on Wednesday, September 12. Emerald Isle will be under a curfew beginning at 7 am on Thursday, September 13, and the Emerald Isle bridge will be closed at that time. No one will be allowed to enter Emerald Isle after 7 am on Thursday, until further notice. The curfew will remain in effect for the duration of Hurricane Florence, until further notice. During the curfew, it is illegal for anyone to leave their own property and travel anywhere within Emerald Isle. After the storm ends, Town officials will assess the conditions in Emerald Isle and make decisions based on public safety. Based on the best information currently available, it is likely that the bridge will be closed for multiple days, and perhaps longer depending on the impacts on the ground. The curfew will be lifted and the bridge will be reopened only when Town officials have determined that it is safe for property owners, residents, and the general public to enter the Town. This information will be disseminated on the Town's various digital platforms listed below when these decisions have been made. Medically-fragile citizens should contact the Carteret County Emergency Management Office at 252-222-5841 or Emerald Isle EMS at 252-354-2249 to arrange helpful assistance. Carteret County, thanks to the hospitality of Wake County, has established an inland shelter for Carteret County residents in Knightdale, NC. The shelter is located at Knightdale High School, 100 Bryan Chalk Lane, Knightdale, NC 27545. Please turn off LP gas tanks, water valves, and water and electrical connections to piers before you leave Emerald Isle! Due to the need for everyone in Emerald Isle to evacuate, the regularly scheduled meeting of the Emerald Isle Board of Commissioners has been cancelled. Town staff are working hard to collect all yard debris before Florence impacts Emerald Isle on Thursday. Please do not put any new yard debris out, as it will likely not be collected. Town staff are working hard to collect old appliances scheduled for collection this Friday. Please do not put any new appliances out, as they will not be collected. Recycling will be collected Town-wide on Wednesday according to the normal schedule. No trash will be collected on Thursday or Friday. Please make sure you secure your solid waste containers in a safe location. The Town Administration Building will be open until 5 pm on Tuesday and normal business hours (8 am - 5 pm) on Wednesday (with a very limited staff). Town offices will be closed on Thursday until further notice. All Town park facilities will close at 3 pm today. The Community Center will be open normal business hours on Tuesday (8 am - 9 pm), but will NOT OPEN on Wednesday. The Community Center will be closed on Wednesday until further notice. All children's programs, special classes, and events are cancelled. The Day4Kids event scheduled for Saturday, September 15 has been cancelled. All Emerald Isle property owners have previously been issued hurricane re-entry permits, either from the Town or from the previous property owner. These permits are available to residents and property owners ONLY, and will be used if it is necessary to limit access to the island after a storm event. Please check to make sure you have your hurricane re-entry permit now, and store it in the vehicle you intend to use to return to Emerald Isle. If you need a replacement permit, please visit the Town Administration Building during normal business hours to secure a new permit. The cost of a replacement permit is $25. Please do not wait until the last minute to secure your re-entry permit, as the Town Administration Building will close on Wednesday at 5 pm. Town staff will be incredibly busy leading up to the storm, so please don't wait until the last minute. For more information about re-entry passes, please visit https://www.emeraldisle-nc.org/Data/Sites/1/media/pdfs/re-entrypermitspolicy.pdf . The Town works hard to keep our residents, property owners, and visitors well-informed, and offers several platforms. - download the Emerald Isle APP at Google Play and The APP Store (search for "emerald isle nc") and enable "push" notifications.